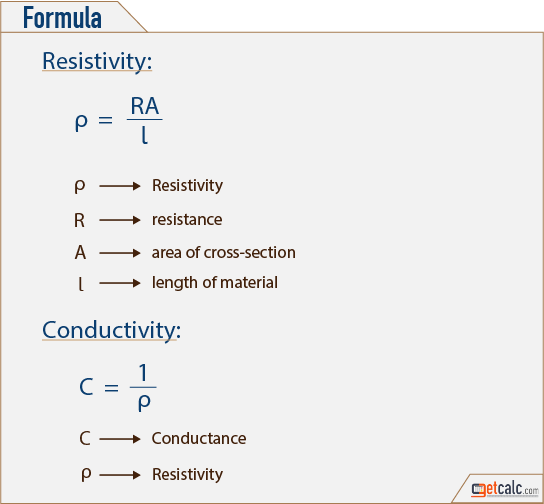 getcalc.com's Resistivity & Conductivity Calculator is an online physics tool to calculate the measure of the resisting or conducting power of a specified material to the flow of an electric current. Resitivity & Conductivity are the basic properties of electricity that determines how strongly a material opposes or how easily passes the flow of electric current through it. The charecteristics of resistivity & conductivity are called as Resistance & Conductance respectively. The unit of measurement for resistance is Ohms (&ohms;) & for conductance is micro-siemens per centimeter (μS/cm) in SI units.